While instructional DVD’s are not a suitable replacement for in person instruction, they do fill an important niche in the firearms training community serving as a method to transfer an introductory level of information at a comparatively low price. For those that have previous exposure to the material, they can also serve as a good review of already learned material that is in need of refreshing. The Personal Defense Network likely has one of the most comprehensive instructional DVD series on the market. 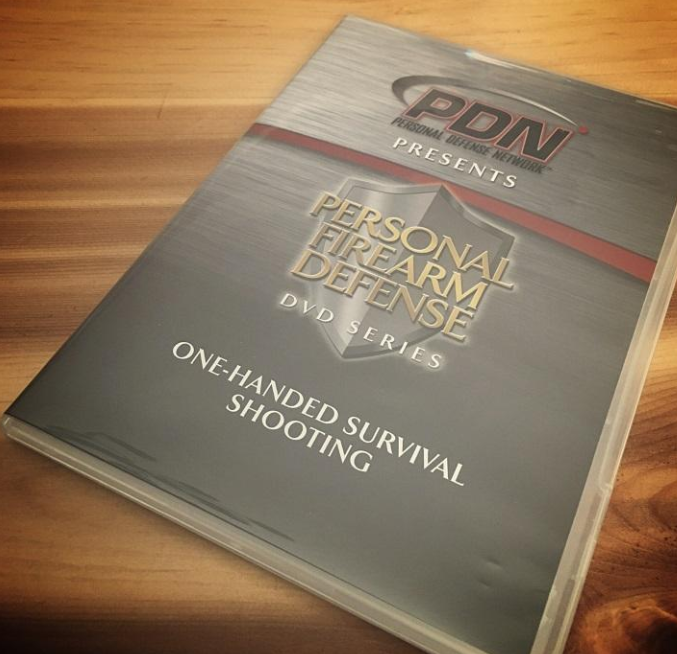 Today’s focus is the PDN One Handed Survival Shooting DVD. If you are familiar with PDN, you will know that Rob Pincus is heavily involved with that brand, and his Combat Focus Shooting flavor typically shows through in the end product. In this DVD, Rob makes the occasional appearance, but Mike Seeklander is the primary contributor to the DVD’s content. Mike is not new to TV or video, at least not now. He is co-host of The Best Defense, was also on Rapid Fire, and Top Shot before that. He does well in front of a camera. Even though this DVD predates most of that experience, Mike is still good on video. He is very well spoken, his thoughts are well articulated, and he has an engaging style. He is a masterful communicator, and that comes through in this DVD, despite its age. The DVD itself is about 1 hour and 15 minutes long. It is arranged into separate segments, covering a specific aspect of one handed manipulation of the handgun. Each segment is wrapped up with a summary of what was covered, highlighting the primary points. This is a nice touch for a DVD that is supposed to be instructional in nature, ensuring that the watcher gets a second chance to catch all the needed information. The summaries are concise, but still thorough. The first few segments of the DVD deal with drawing the handgun one handed, both strong hand only, and weak hand only. The next few cover emergency reloads, and the last few deal with malfunction clearance. If you have not had exposure to this sort of material before, each technique is both well explained and well demonstrated. Mike does a good job not just explaining and showing the basics of each technique, but also bringing out a great deal of nuance and small aspects of the technique that ensure proper execution. The explanation and demonstration is probably good enough that a person who had a fair bit of firearms experience, but not specific experience with one handed manipulation, could make some good progress working techniques in a dry fire setting. As always, the risk is that without the watchful eye of an instructor, mistakes in technique often times go unnoticed. If a person has had exposure to this material before, the DVD will serve as an excellent refresher. It is often those small but critical aspects of a technique that are forgotten over time, and they are highlighted and brought to the forefront in this DVD, generally more than once to make sure they are not missed. My one critique of the DVD is that it is nearly a decade old. As with all things related to technique, over time it evolves. While the information in general is very good, and still relevant, certain parts of it are not as optimized as it could be. Specifically in this case, the strong hand only draw that Mike demonstrates in the video is not consistent with what Mike teaches now. I think an update is likely due for this DVD for the most current information. Even though it is becoming a bit dated, in general, the information is till acceptable. The presentation of the information is above par I would say. Combine the two together and that is where the quality lies. Not just with the content, but the quality of how the information is presented and communicated. Of the instructional DVD’s I have watched, Mike is one of the best at communicating ideas and information, and that certainly lends to the quality of this DVD, specifically. For the retail price of $30.00 I think it is a worthwhile DVD to add to the collection, even if for no other reason than to look back at occasionally to refresh material. Nate spends his days trying to find ways to afford more ammo. Nate is a performance-driven shooter with over 400 hours of formal firearms instruction, dabbles in local handgun matches, and teaches the occasional handgun class.